Dalworth Restoration was honored with another State of Texas, Office of the Governor Consumers’ Choice award for excellent water damage restoration service. The company was bestowed this prestigious award four years in a row, which is a high compliment from customers and a nice confirmation of the consistent quality of service provided. This Dallas-Fort Worth fire and water damage restoration company has shown, yet again, that hard work, dedication and skill are certainly appreciated. 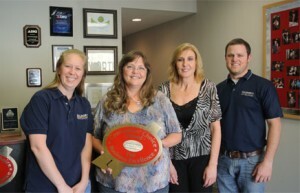 The company has received numerous consumers’ choice and industry awards for superior service and professionalism. Dalworth Restoration excels at providing comprehensive fire and water damage removal and cleanup services. The personnel is well trained, service oriented and experienced. Dalworth Restoration is a full service water damage removal and flood cleanup company. However, the company’s services are not limited to only water extraction and drying. These professionals handle complete residential and commercial rebuild and restoration services following natural disasters such as hurricanes, tornadoes and floods as well as man-made acts of vandalism and arson. In addition, human error caused fire and water damage emergencies due to oversight and negligence as well as secondary damages such as soot cleanup, smoke odor removal and mold remediation are expertly repaired. Quality crawl space encapsulation, basement waterproofing and finishing and content restoration are also services the company routinely provides.